A very cute little comedy. Christoper "Kit" Madden (Claudette Colbert) is a huge new celebrity. She has written a book that has taken America by storm. She is travelling to Hollywood to oversee the movie version of her book starring Cary Grant as the hero, Mark Winston. When she reaches her train she receives a telegram from the head of the studio telling her that Cary Grant has a conflict and can not be in the movie. 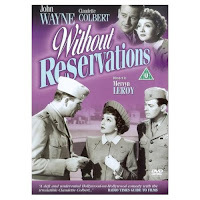 As she is writing her reply to the executive two young marines, Rusty (John Wayne) and Dink (Don DeFore), sit beside her. When she looks up from her writing she meets Rusty's eye and instantly recognizes him as Mark Winston come to life. However, when the marines make a comment about the book and its radical ideas she decides to keep her true identity a secret. She decides to get Rusty to Hollywood so he can take a screen test for the part. However, a serious of comical events threatens Kit and Rusty's budding relationship. I really enjoyed this little movie. John Wayne was very impressive as Rusty. Who knew that he could carry himself in a comedy? Colbert was wonderful as the novelist and DeFore was wonderful as the comic relief. I highly recommend this one because it is a very cute romantic comedy.